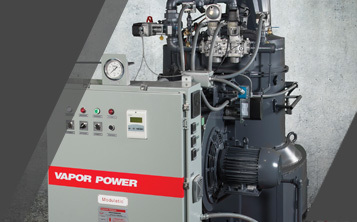 Vapor Power offers a wide range of after-market support and services for your Modulatic Steam Boiler. From the first day of operation and for the life of your boiler, Vapor stands ready to assist. As one of the industry’s leading manufacturers of boilers, packaged steam generators and thermal fluid heaters, Vapor Power International has everything you need to keep your steam boilers operating in top condition. That includes complete retrofit upgrade kits to outfit your Modulatic with the latest in controls and components. All built to the highest quality standards and codes, including ASME, FM the U.S. Coast Guard, ABS, CGA and Lloyd’s Registry. Like our boilers, our retrofit upgrade kits are developed using the most advanced production and technology to ensure the superior quality of our products.